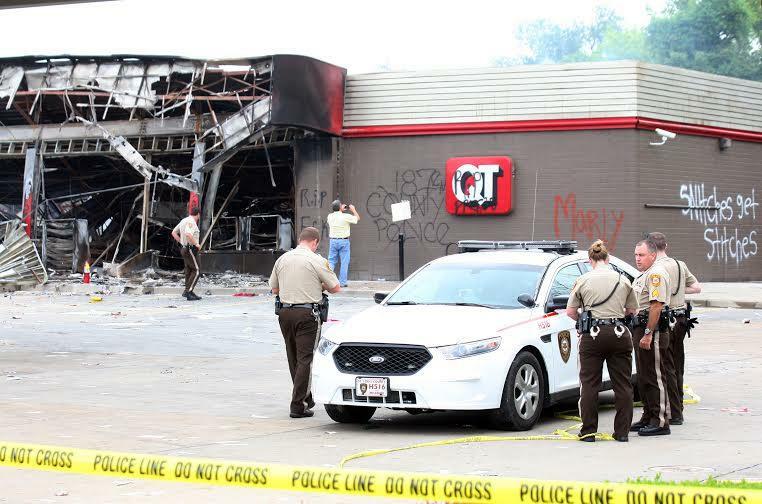 Members of the St. Louis County Police Department remain on the lot of the QuikTrip Gas station in Ferguson, Missouri on August 11, 2014. Thanks to the way most cities like Ferguson are structured, the chief executives and city councils of most St. Louis-area cities can’t directly make changes to police departments. That’s the responsibility of either a city manager or, in the case the St. Louis County Police Department, a commission appointed by a county executive. This arrangement came about as a way of keeping politics out of the administration of government. And as a result, many local governments here were organized to make elected representatives of local cities and towns fairly weak – and give unelected administrators more power. The aftermath of Brown’s shooting death isn’t likely to change this arrangement overnight. But it’s likely that it will bring about more discussion about who oversees police departments – as well as how powerful local elected officials should be. What entity directly oversees the Ferguson Police Department? Ferguson Police Chief Tom Jackson's department is overseen by Ferguson's city manager. The city manager is also responsible for appointing Ferguson’s police chief “on the basis of his administrative abilities and his qualifications as a law enforcement officer.” He also oversees the rest of Ferguson’s departments, including the agencies that run the city’s parks and fire department. University of Missouri-St. Louis political science professor Terry Jones said this is a pretty common arrangement for cities in St. Louis County. He traced it back to the Progressive Era, a time when political activists wanted to wrestle power away from mayors and city councils. He said the “underlying premise” of the move was allowing the “pros” to make administrative decisions – not the elected officials. “It’s separating politics from administration,” Jones said. 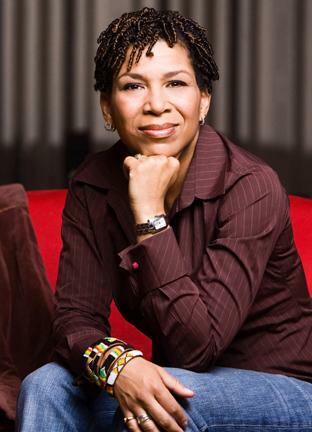 What power does the mayor of Ferguson have over the police department? In a formal sense, none whatsoever. So, what power does the mayor of Ferguson have over anything? Knowles, Ferguson's mayor, faced intense scrutiny after Brown was shot and killed, with the most common refrain being why he didn’t do more to stop the situation from spiraling out of control. While Ferguson Mayor James Knowles III represents his city at events and in the media, he has fairly little administrative power over Ferguson's city government. But the long and short of it is that Knowles has very little formal power. He is, in effect, an at-large councilman who is in charge of presiding over the city council’s meetings. He often represents the city at formal events, such as a recent groundbreaking of a bus station. And the city’s ordinances allow him to appoint certain committees. That’s about it. Like most mayors of St. Louis County towns, Knowles is a part-time elected official. He gets paid about $350 a month and has another source of employment. Jones said the low pay and relatively high time commitment has an impact on who runs for these types of positions. Still, not everybody is convinced that mayors are completely powerless when a city manager is in charge. St. Louis County Councilwoman Hazel Erby said some cities "hide behind that city manager type of government," because "they get involved in everything else." "I definitely think that we should be more involved," said Erby, D-University City. "Because when things go wrong, we are held responsible for it. So therefore, we should have more input, more say-so about what goes on. And I know that in Ferguson, the mayor says that he has no control over the police department or the city council has no control. But I don't agree with that." Are there any St. Louis area cities where this isn’t the case? Jones could think of only three cities – St. Louis, St. Charles and Florissant – that get paid a big enough salary to be considered “full-time” mayors. These officials tend to have a lot more power than, say, the mayor of Ferguson. For instance, Mayor Francis Slay’s office appoints the Department of Public Safety director, who in turn oversees the city’s police department. Slay is also responsible for appointing people that run St. Louis’ various departments, and can veto bills – two things the mayor of Ferguson can’t do. How about the St. Louis County Police Department? Who controls that agency? The St. Louis County Board of Police Commissioners is tasked with overseeing the St. Louis County Police Department, which is one of the largest law enforcement agencies in the state. 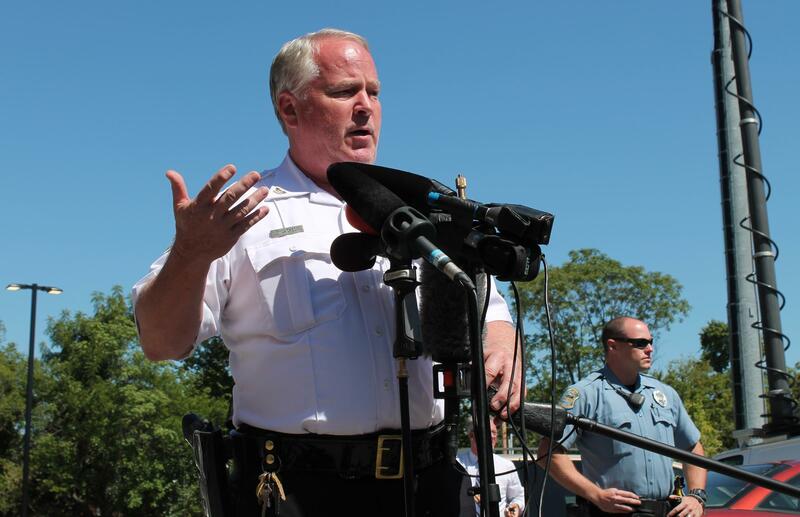 St. Louis County Police Chief Jon Belmar was hired by the county's Board of Police Commissioners. The county executive doesn't have a direct role in supervising Belmar, though he is not completely powerless over the police department's operations. The board consists of five members appointed by the St. Louis County executive. It can’t have more than three members of a particular political party, and members cannot hold any other elected office. St. Louis County’s charter states that the police board has fairly specific duties in overseeing operation of the department. That includes hiring St. Louis County’s police chief, which occurred earlier this year when commissioners tapped Jon Belmar to lead the department. Does the St. Louis County executive have any power over the police department? Directly, no. But he has a bit more power than the mayor of Ferguson. And the county executive can also make an impact through his appointments to the police board. Back in 2009, then-Chief Jerry Lee was effectively forced out when Dooley rearranged the composition of the board. There's also an ordinance that gives the county executive power to declare a state of emergency and exercise "the power to enforce all rules and regulations relating to emergency management." That can only be done in the "event of actual enemy attack upon the United States or of the occurrence of disaster from fire, flood, earthquake, or other natural causes involving imminent peril to lives and property in St. Louis County." It could be argued that the events in Ferguson fit this description. Is there any chance the unrest in Ferguson may prompt the county executive to have more power over the police? It’s possible, but not likely. Giving the county executive any sort of direct control over the police department is likely to engender a lot of opposition. Last year, the St. Louis County Council balked at several of St. Louis County Executive Charlie Dooley's nominees to the Board of Police Commissioners. They feared Dooley was trying to engineer an ouster of then St. Louis County Police Chief Tim Fitch. Jones said the city of St. Louis is currently experimenting with the idea of having an elected mayor have direct control over a police department. But whether the last couple of weeks in Ferguson should prompt more direct involvement from leaders of other cities or St. Louis County, he said, remains to be seen. A group of attorneys is asking Ferguson’s mayor to “wipe the slate clean” and grant clemency to certain people who broke the city ordinances, such as speeding or getting a parking ticket. The St. Louis County Council authorized up to $1 million to be spent to help Ferguson residents pay for expenses incurred during nearly two weeks of unrest. Without opposition, the council authorized the county to spend up to $1 million to help Ferguson residents who felt the impact of riots and looting. For more than two weeks, the city was under almost constant turmoil after Ferguson Police Officer Darren Wilson shot and killed Michael Brown earlier this month. Join St. Louis Public Radio and community leaders for a conversation about race, law enforcement and more.